Lewis Hamilton won the 2016 Monaco GP, nearly halving the championship lead that Mercedes AMG F1 team-mate Nico Rosberg has managed to amass thus far in the 2016 season. Finishing second was Red Bull Racing's Daniel Ricciardo, who was the fastest man on track for most of the weekend, and would likely have won the event if his team hadn't botched up his pitstop, leaving him stranded in the box while they struggled to get the tyres to he needed to him. Third place went to Sahara Force India's Sergio Perez, who put in a good drive to finish ahead of Ferrari's Sebastian Vettel. The 2016 Monaco GP started behind the Safety Car, with heavy rain making conditions tricky on the tight and twisty Monte Carlo street circuit. 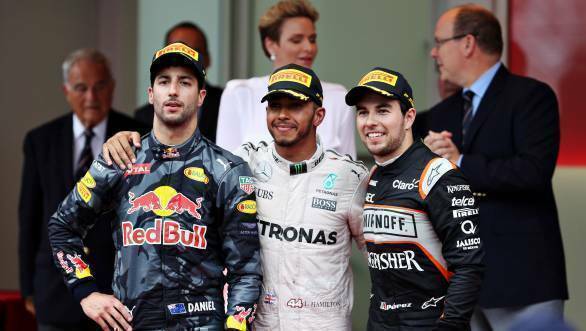 Ricciardo, who had taken his career first F1 pole, was in the lead, with Nico Rosberg second and Hamilton third. The race then got going properly on the seventh lap as the Safety Car went into the pits. This, despite the fact that Jolyon Palmer crashed during the restart, causing a virtual Safety Car period. The man at the front, Daniel Ricciardo managed to establish a gap between himself and second-placed Rosberg, who, it was later established, had brake issues. Mercedes then decided that it would be best if Lewis, who was clearly faster than his team-mate, would get the jump on him. Once the defending world champion was in second, he set about attempting to catch Ricciardo. Something of an ask, given that the Red Bull Racing driver was 13 seconds ahead of him. It was at the second round of pistops that things swung away from Ricciardo. Hamilton was in the pits first, switching to slicks and heading back out on track. Ricciardo came in for slicks one lap later, and found that he'd been called into an empty garage. There were no mechanics, and no tyres, as the team scrambled in the back to try and get super soft tyres to him, as opposed to the soft compound tyres that they had initially been planning on. The pitstop cost him 10 seconds. And though he rejoined the track nearly side by side with Hamilton, overtaking was impossible. The run to the flag saw Ricciardo always right there behind Hamilton, but unable to make it past him at the Monaco circuit, famous for a lack of overtaking opportunities. Sergio Perez put in a particularly strong drive, moving from seventh place to third at the end of the race. Finishing in fourth, behind him, was Vettel. While Fernando Alonso put in a terrific drive to finish fifth for McLaren. Nico Hulkenberg finished sixth, ahead of a frustrated Nico Rosberg who could do no better than seventh, seeing his 43-point title advantage cut down to 24. Eighth place went to Carlos Sainz Jr, while Jenson Button made it a double points finish for McLaren with ninth place. Felipe Massa took home the last of the points in tenth.